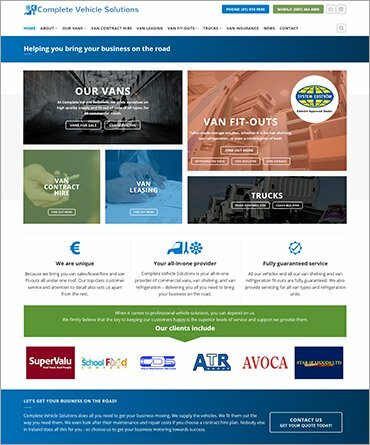 This project was an extensive re-build of the website of an existing client, Complete Vehicle Solutions. Complete Vehicle Solutions are a unique service provider in meeting commercial transport needs in Ireland. Based in Dublin they are the only operator who will source and supply a client with a van or truck, fit it out exactly as required with shelving and/or refrigeration units, and provide a range of finance options including contract hire, leasing, and outright purchase. The business was established only in 2016, with a basic ‘start-up’ website. It enjoyed phenomenal growth in its first year – so much so, that the client returned to us for a more comprehensive and ‘professional’ website. We were happy to oblige. We engaged with the client to learn how the business had grown since we built the original site. We conducted further market research to help formulate an SEO strategy, and we agreed this with the client. Our senior copywriter then produced updated text content for the site, and we sourced images from both the client and selected partners. Once we agreed the content and outline plan with the client, our design team got to work. We got rid of the old ‘basic’ look, and introduced e a far sleeker and more corporate website design. A key feature of the home page is strategic placing of dynamic graphics and links, to lead the user to content reflecting the key elements of the client’s business. Text snippets on the home page reinforce how Complete Vehicle Solutions is unique, and the benefits of dealing with them. We also strategically used of the logos of major clients, and of the makes of vans/trucks supplied. We laid out internal pages in an equally attractive and strategic manner. We interspersed text content with images, headings, and bullet points, for a better user experience. A common sidebar and ‘floating’ head means all links are in easy reach at all times. We included clear calls to action, and easy means to access the contact form. Our client was delighted with the results. You can see why by viewing the finished site here.